Former Triad High School varsity athlete Ryan Hunt is returning to the area as a doctor with the Memorial Health system. Ryan Hunt, a 2005 graduate of Triad High School, has returned to the area after completing his education as a doctor of osteopathic medicine. Based in Marysville, Hunt will join Memorial Medical Group, practicing at both the Memorial Family & Sports Medicine │Gateway Medical Center and the Memorial Specialty Care Practices │Urbana locations, bringing services to both communities. Hunt was a letterman in football, basketball and baseball at Triad and he is looking forward to working with patients of all ages, including athletes. 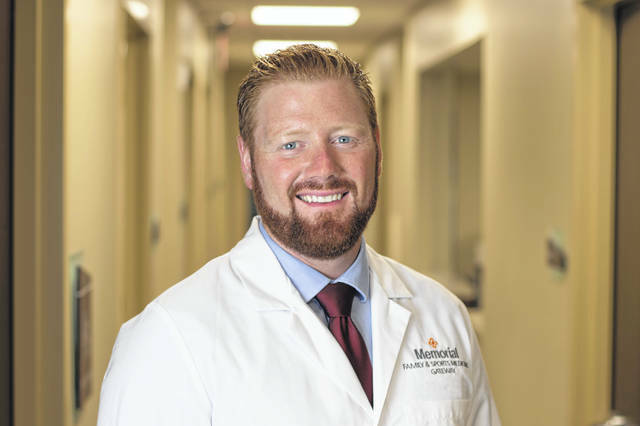 Board certified in Family Medicine and Sports Medicine fellowship trained, Hunt recently completed his residency in Family Medicine at OhioHealth Grant Medical Center in Columbus, where he has been Chief Resident since July 2016. He graduated from the Ohio University Heritage College of Osteopathic Medicine in Athens. He has treated high school and college athletes and has provided medical assistance at marathons, triathlons and IRONMAN Ohio. He is a member of both the American and Ohio Academies of Family Physicians. Born and raised in Champaign County, Hunt is eager to bring all his training back to the community that raised him. At the Memorial Specialty Care Practices │Urbana, he will focus on care for non-surgical orthopedic patients and anyone recovering from injury. Here, he will treat general orthopedic issues, agricultural/occupational injuries, joint/back/neck pains, concussion care and management, student-athlete/adult/weekend warrior injuries. He is accepting new patients. Call 937-772-4191 to schedule an appointment in Urbana. Hunt will join Jacob Boucher, MD, and Mackenzie Morris, CNP, at the Memorial Family & Sports Medicine | Gateway practice in Marysville and will be accepting new patients. Appointments can be made by calling the office at 937-578-7950. In this office, he will provide both primary care and sports medicine treatment and evaluation for patients of all ages, including those who are not athletes. He will also provide concussion care and management, as well as Platelet-Rich Plasma (PRP) Therapy for injured patients. Memorial Health is an independent health system based in Marysville and consists of Memorial Hospital’s main campus and satellite outpatient locations including Memorial City Gate Medical Center; Memorial Urbana Medical Center; Memorial Hospital Outpatient Surgery Center; Memorial Gables – a skilled nursing facility; Memorial Medical Group – a network of 31 physicians and mid-level providers with office locations throughout Marysville, Plain City, Richwood and Urbana; and the Memorial Health Foundation. To learn more, visit memorialohio.com.